Beautiful!! And oh so true! Funny…I never think of you…& sailing too close to the shore in comfort at the same time…. The only thing that leaves me more amazed than the fact that he put to words the very desires of my heart is that he (Drake)is an ancestor of mine on my father's side and I never knew of his great faith. love this. i'm going to repost it. My Katie just did a canvas with the first part of this quote for my Lexie. I don't think she's seen the whole thing. Yay…going to show her this! I have never read that, and when I saw the date I was a bit in shock. Isn't it something how our needs don't seem to change, through 400+ years. We're all still looking for those same things, those same feelings and emotions. And thank the Lord, He is the one providing that journey 🙂 Very cool…thanks for sharing! thanks for this reminder of naval history and Biblical truth. love this 🙂 What a perfect reminder for me. I have always loved this, I have a copy in my Bible! Thanks for sharing it again! I just printed this out and am planning on hanging it up on my frige. Ummm..this is good…hard to invite and pray for this but good. Please pray for Katie Cramer at Katiecramer.org. Katie is adopted by the Cramer family from China. She is losing her battle of Leukemia. I had tears in my eyes as her Mom had to tell her very soon she is going to be with Jesus. Please put her on a prayer list, come visit her site and send words of encouragement. Thank you very much everyone. Amazing…Just emailed it to a few dear friends who I knew would also be moved by it. great reminder to me! 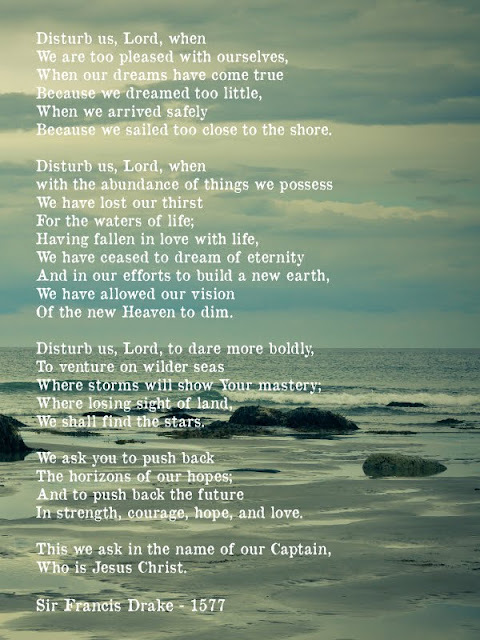 we just moved to colorado….which has been a difficult move for me….but coincidentally enough, this prayer was read at a church we visited while out here looking at houses. i had never heard it before then and it really spoke to me. been here a week now and the reminder came at good timing. thanks for sharing!